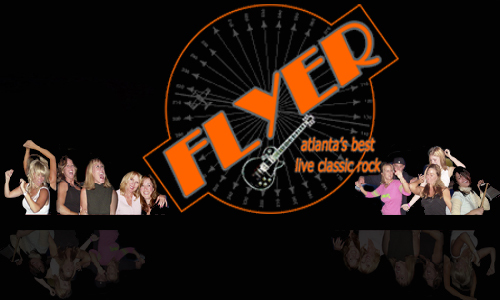 FLYER just might be the most rock-solid cover band in Atlanta, Georgia. Formed by musicians with a driving passion for playing live, every performance gains more fans ~ click here to see what the media has noted! We offer high energy classic rock, dance, and party music. And we work hard at having a good time! It's hard to sit still because we bring the music you grew up on. From rock to guitar/organ driven blues to smooth acoustic, Flyer can cover it all. You'll hear the power of the Stones, the soul of Van Morrison, and the Southern anthems of Lynyrd Skynyrd. We can drive hard like Santana or stay soft like Elton John. We lay down the best road-tested classic rock, R&B standards, and lost cuts from the 1970's, often with our own twist. We can play acoustic or electric, and have the repertoire needed to adapt to any situation. Whether a party, wedding, club, corporate event or special night, we'll make sure your night is successful. Want to be a Frequent Flyer? Click here to become a Frequent Flyer and we'll send you information on when we are playing next.